These steps are for TP-Link Routers and Modems including but not limited to: TL-WR1043ND / TL-WR841HP / TL-WDR3600 / TL-WR843ND / TL-MR3040 / TL-WDR4300 / TL-WR940N / Archer C7 / TD-W8901G / TL-WR842ND / TL-WDR4900 / TL-WA730RE / TL-WDR3500 / TL-WA830RE / TL-WA850RE / TL-WR1042ND / TL-WR340GD / TL-MR3220 / TL-MR3420 / TD-W8951ND / TD-W8961ND / TL-WR740N / TL-WR741ND / TL-WA801ND / TL-WA901ND / TL-WR340G / TL-WR841ND / TL-WR941ND / TL-WR743ND / TL-WR740N / TL-MR3220 / TL-WR1043ND / TL-MR3420 / TL-WR841N / TL-WR940N / TL-WR340G / TL-WR741ND / TL-WR941ND / TL-WR841ND / Archer C7 AC1750 / TL-WR842ND / TL-WDR3600 / TL-WDR3500 / TL-WDR4300 / TL-WDR4900 / TL-WR702N / TL-WR710N / TL-` / Archer C5 AC1200 / TL-WR743ND / Archer C2 AC750 / RE210 AC750 / Archer C20i AC750 / Archer D2 AC750 / TD-W8961N / TD-8816 / TL-WR720N / TD-8616 / TL-WR843ND / TD-8817 / TD-8840T / TL-WR840N / TL-WR700N / Archer C9 AC1900 / Archer C8 AC1750 / Archer C20 AC750 / TL-R480T+ / TL-ER6020 / TL-R470T+ / TL-ER6120 / TL-ER604W / TL-R600VPN / TL-ER5120 / M5250. The steps for all TP-Link devices are almost the same. Open http://192.168.1.1/ in your Web Browser. A dialog will appear asking for Username and Password. Enter admin in both Username and Password. Click on “Add New..” and enter the Service Port and IP Address you want to forward. Here I am forwarding Port Number 27015 with Protocol ALL which is default port for Counter-Strike 1.6 Server. Your port should be forwarded successfully now! Check your router box and your password should be written somewhere on it. Otherwise ask your ISP and they will provide you the device password! 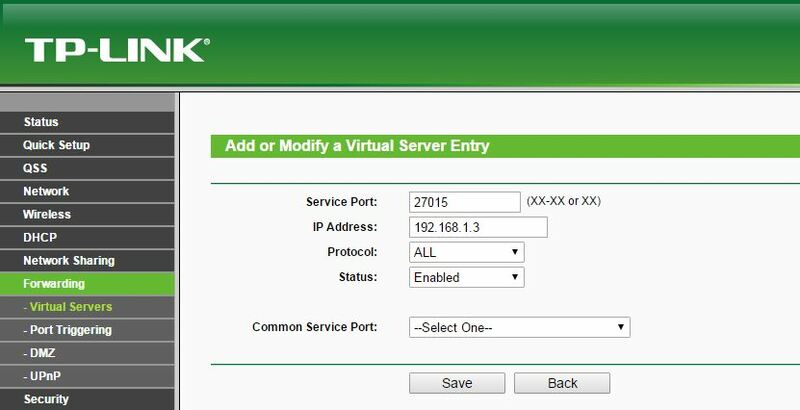 Taimoor i want to port forward on tp link router but when i type admin and admin in both box the page does not open in 192.168.0.1.What should i do? That means someone has changed your admin password. You can ask the person who installed your network for that password. -Turn off your router by pushing the small button on back side. -Keeping the pin pressed, turn on your router and wait for 15 seconds. -All your router lights will blink for a moment and now your can release the pin. This way your router will be reset to default settings and default admin password! thanks bro for telling and i forgot to tell you i am ali sami nick agent 47 who ask about how to buy admin in your server long time ago do you remember him! 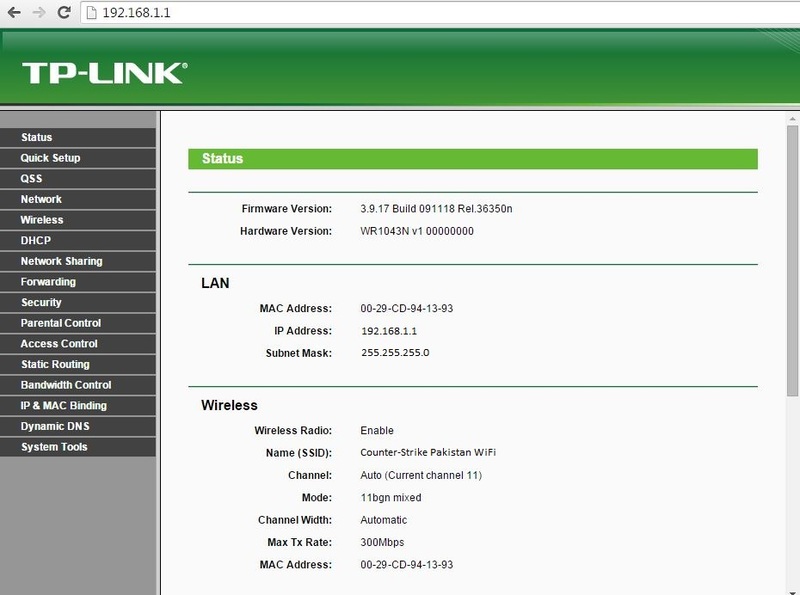 Since your TP-Link Router’s IP is 192.168.0.1, your subnet is “192.168.0”. So you have to enter “192.168.0.3” or check your Local IP Address by entering “ipconfig” in command prompt or cmd. In my case, my router’s IP was 192.168.1.1 and that is what I have used in my server. Let me know if you still can’t make it work. i am completed all steps and i am also in server of mine but it is not showing on others. .cWhich IP Address did you send to your friends? Make sure it is your Public IP Address. BHAI YAR MEIN NA APKO 500 wala ufone card send kr dia hai ? yar faizan mere cuz hai wo faizan ke naam sai khel raha tha tumne usko ban kar diya uski wajah sai main bhi nahe apa raha hon yar unban karo yar mujhay to kaam as kaam ? ip ban kia tha kia kuch samjh nahe arha hai . Mere bhai main ne ban nahi kiya (1)Faizan ko. Ali Ahmed ne kiya tha. Bhai main ne ban nahi kiya. i have sended you the screenshot and the demo of A-kz that he banned me for no reason . i am trying port forward in my ptcl modem plus router i did every thing but my port is not opening please help ?? Failed! Your Port 27015 is not open. Please try again. is static ip is compulsory for ptcl users ??? Bhai mein na apko Facebook par 5 cards send kr dia hain !!! ap mjhe admin banao please!!! I am selling facebook crunch hacking tools on burpsuit who interest ? May i know details about this tool please assist . I reserved my nick on the web but now i am unable to get in the server , Please help me which command to put in console ?? i need some help i will pay u for this plz help me any one can not join into my cs 1.6 server help plz…..